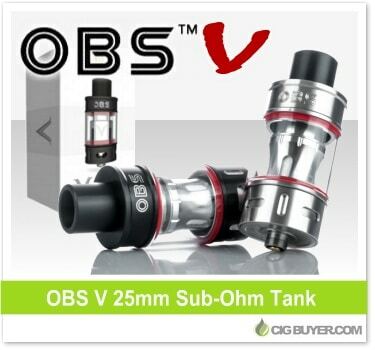 From the makers of the highly acclaimed Engine RTA series comes a brand new sub-ohm tank – the OBS V Tank. It features OBS’ signature top side-fill design and incorporates the brand new OBS V Coil platform. Compatible with SMOK’s TFV8 Tank, OBS’ V4 (120 to 260W), V8 (80 to 180W), and V12 (50 to 150W) coils are designed for high performance vaping and generating massive clouds of vapor. The V Tank comes with one of each coil head and holds 5.2ml of e-juice with quad adjustable airflow slots on the base.